A website is the online advertising billboard that you can use to showcase your projects, share your thoughts and sell products. First impressions in the online world matter a lot, and it is imperative that you create a website that best represents your brand or image. Website designers and developers throughout the world strive to build highly responsive, gorgeously looking and exceptionally flexible websites with smooth navigation, advanced functionality, and intuitive interface. 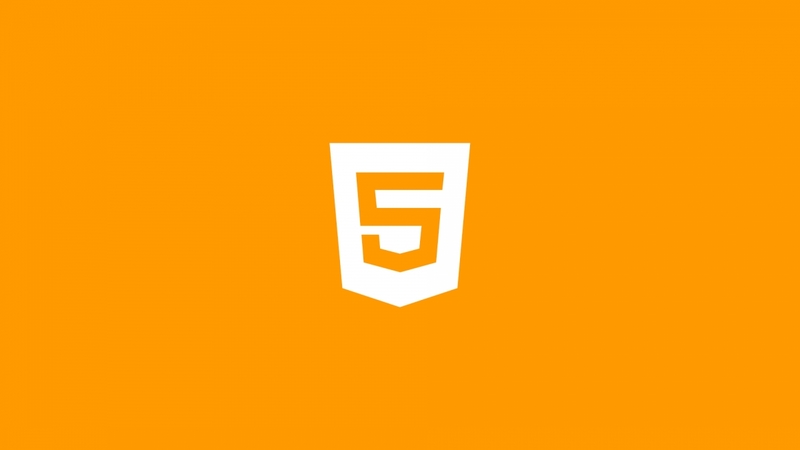 To establish a powerful personal or business website, you need to use the right HTML templates. If you are ready to start your own blog, resume, online shop, portfolio or personal website, but are undecided on which HTML website templates to use, this article is for you. Do not let lame excuses like “I have no coding language” or “I am too busy to do it” stop you from creating a website you can be proud of. Finding the best HTML website template on the web can be daunting if you do not know where to start looking. Lucky for you, we have done all the hard work so you don’t have to. 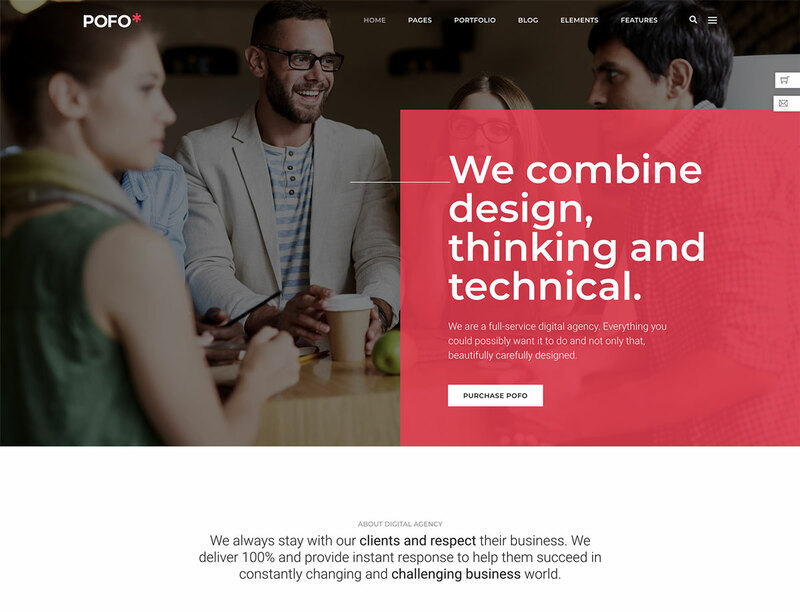 We have rounded up a list featuring 15+ of the best HTML website templates for 2019. This list opens your eyes to what premium templates have to offer. With just a little bit of creative tweaking, your website will be live before your coffee gets cold. Attitude HTML Template is an innovation of talented designers and developers perfect for Agencies, Creative Professionals, and Freelancers. This cutting-edge template is based on Foundation 6 and XY Grids and it is natively compatible with any device and screen resolution. This masterfully crafted template is developed in accordance with the latest web trends to offer smooth navigation and an intuitive interface. 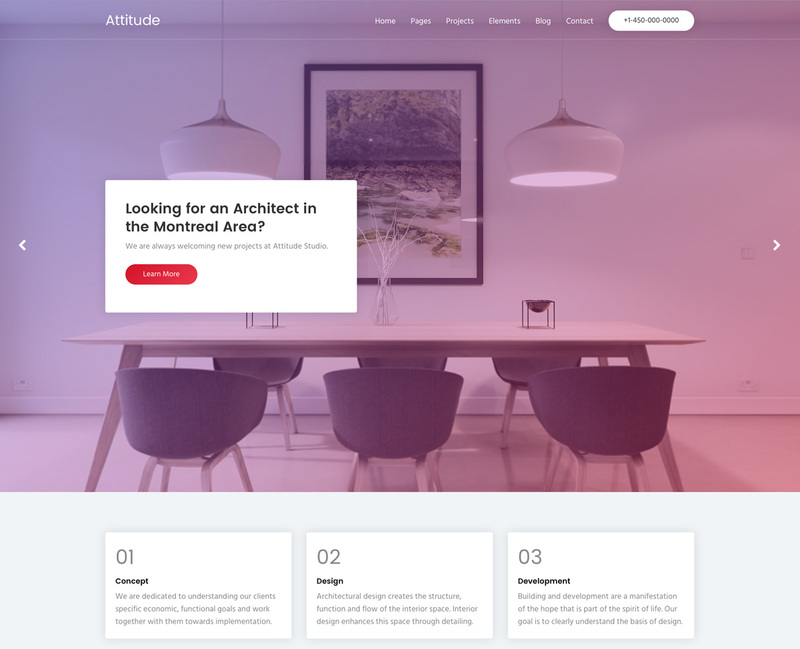 If you want to know more about this great HTML template, there are 6 Homepage Demos (Nonprofit, Architect, Conference, Dentist, Conference Boxed, and Creative Agency) available to try out. With Attitude template, you get Pages, Posts, Projects and other premium HTML elements. 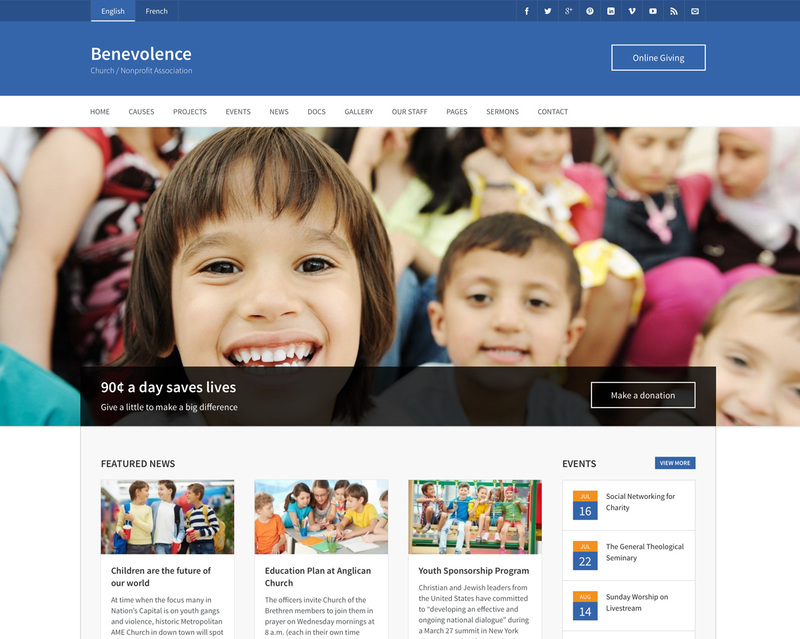 Another HTML template from our list is Benevolence HTML Template. Benevolence is an awe-inspiring, clean and customizable template that boasts a unique style and trendy design suitable for Churches, Foundations, Nonprofit Associations and Charity Organizations. You can make a friendly-looking website complete with Gallery, Projects, Causes, and Events using this template in a few steps. This charity HTML template has everything you need to run a fully-fledged charity website. With a friendly interface and smooth navigation, your donors and supporters will enjoy an optimal browsing experience. Top-notch expert support directly from a WPlook Themes technician is available 24/7. Get Benevolence Charity HTML Template and build your dreams website! 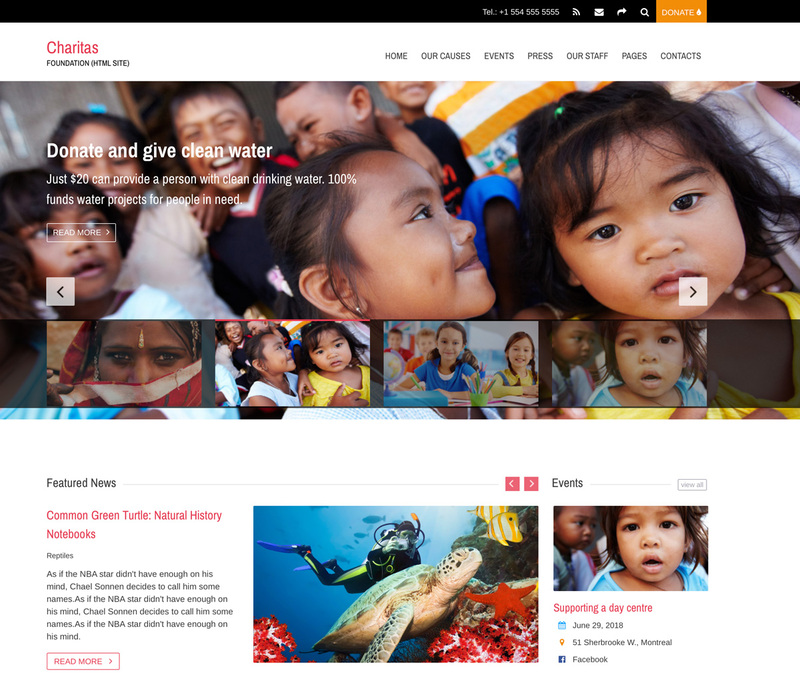 Built using the latest technological developments and web design trends like HTML5 and CSS3, Charitas HTML Template is perfect for Foundations, NGOs and Charity Organizations. The template provides a distinctive touch to the overall design which will complement the creative outlook of your site. All the codes in this theme are clean and well-organized. You can install Charitas template with a single click and begin customizing your nonprofit website immediately. Thanks to the unlimited variety of color schemes, you can build a striking website in minutes! 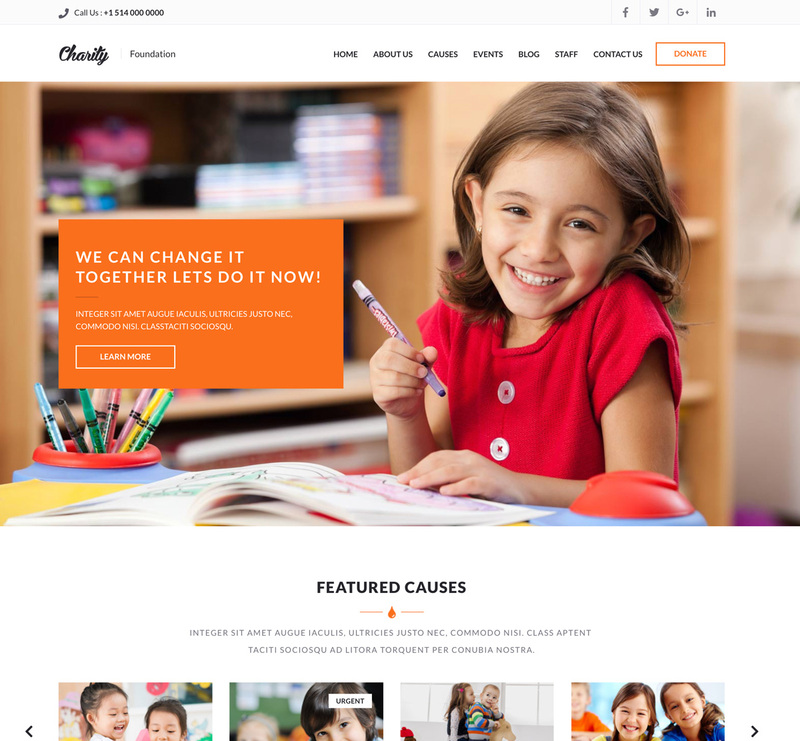 Charity is an outstandingly technological savvy nonprofit HTML website template with unlimited customization possibilities, extensive functionality, and multiple advanced features. Charity template is a delight for webmasters who want to build a website for a Charity, NGO or Foundation as it allows them to showcase their aesthetic sense. Alongside Charity’s cool and trustworthy design created by WPlook Themes using Foundation Zurb 6 and XY Grids, you get usable additional features like Parallax Background, Social Links , and Premium Slider. Charity Life is an elegant and eye-catching HTML Template created with non-profits in mind. This beautiful template is suitable for Churches, Charity, NGO, Foundations and Nonprofit organizations. Charity Life HTML template includes all the necessary smart features that your website could possibly need like Raise funds for a cause, Promote your events, Publish different kinds of documents, and much more. Get Charity Life HTML template today and create amazing websites! While it might not be top of the list, Conference could definitely be worth a second look. This is an HTML template designed for any kind of events, conferences, meetups, exhibitions etc. This amazing template is fully responsive and optimized for tablet and any others mobile screen. 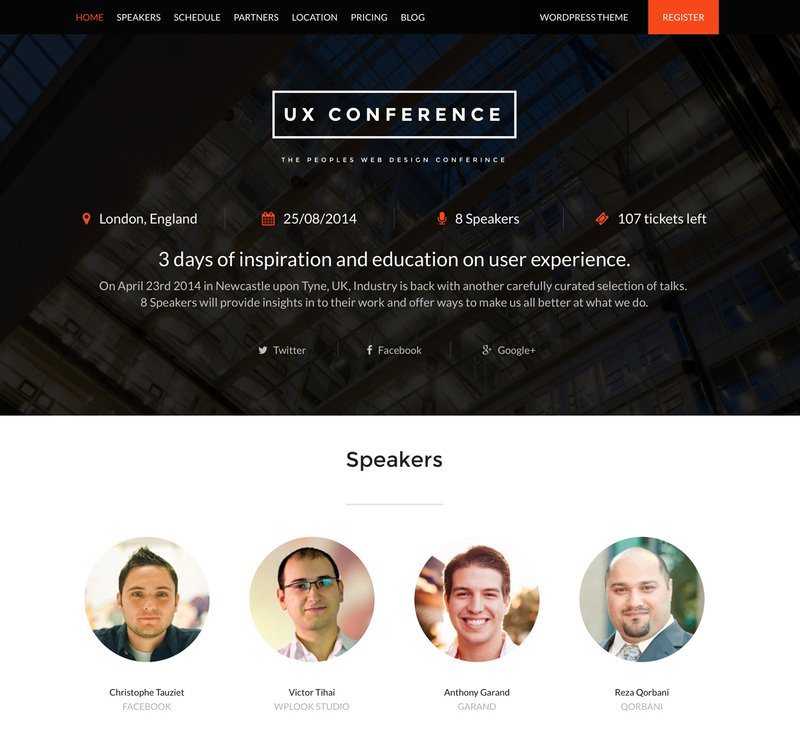 The template offers everything you need for your Conference website. Conference HTML Template includes powerful features like Speakers, Schedule, Mailing List, Partners, Buy Tickets, Testimonials, Blogs posts and much more. Get the Conference HTML Template today and create a beautiful and feature-rich website for your next event! Pofo is a simple, responsive and creative HTML Template best suited for Corporate, Agency and Portfolio websites. This Bootstrap responsive template is increasingly gaining popularity in the web design world as it provides webmasters with the creative freedom to build an awesome online presence. Pofo was developed with all modern technologies in mind. This fast loading HTML template has a fresh looking interface to impress your online visitors. Alongside the catch design and sleek visual effects, Pofo offers 25 ready Homepage demos, 210+ HTML Pages, 150+ Elements with different styles and a rich UI kit to boost your website’s performance. 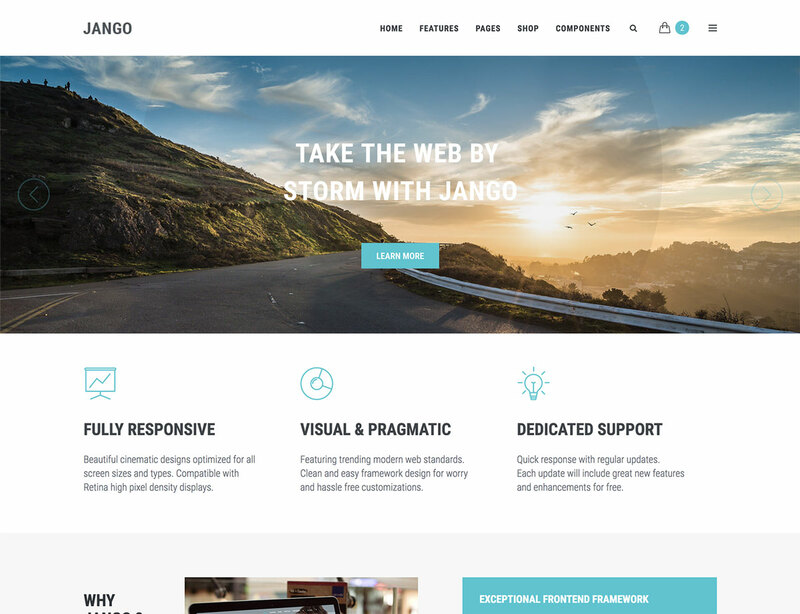 Jango is a unique, clean and engaging Component-Based HTML5 template that is ready for anyone looking to create a superclass corporate website. Powered with SASS and Bootstrap, this theme is especially good to showcase your previous and ongoing projects. For a clear and good-looking typography, you have 22 Color Schemes. With 300+ Component Layouts and multiple Demo Pages to choose from, your site is sure to grab your visitors’ attention and keep them coming for more. 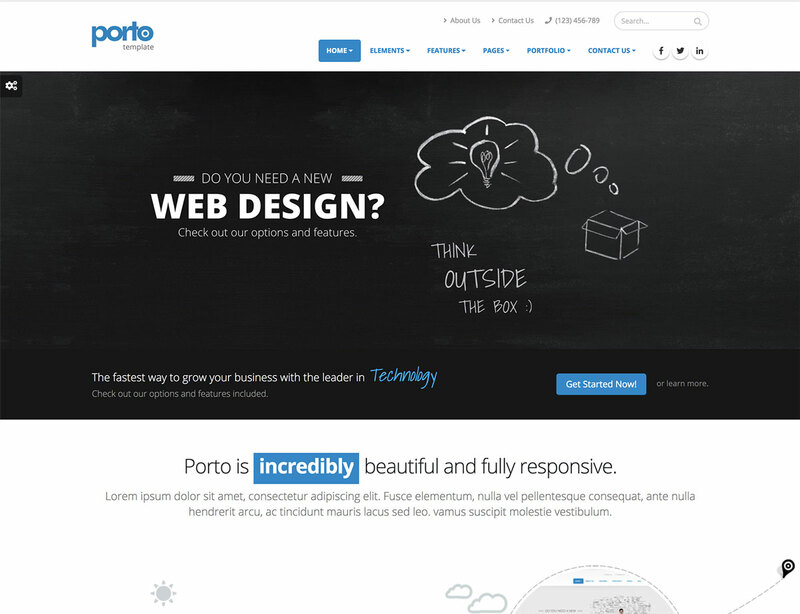 Porto Admin is a multi-purpose, lightweight and minimalistic HTML5 website template perfect for building a simple and stunning personal or business website. Porto Admin has an elegant and creative design at all sections. Built using Bootstrap 3, Porto Admin is fully responsive and supports all the major browsers, both new and old. This beautiful template is loved by web designers and developers because it is easy to use and customize. Other Smart features include 60+ Template Pages, Google Fonts Support, Interactive Chart and Cross Browser Compatibility. 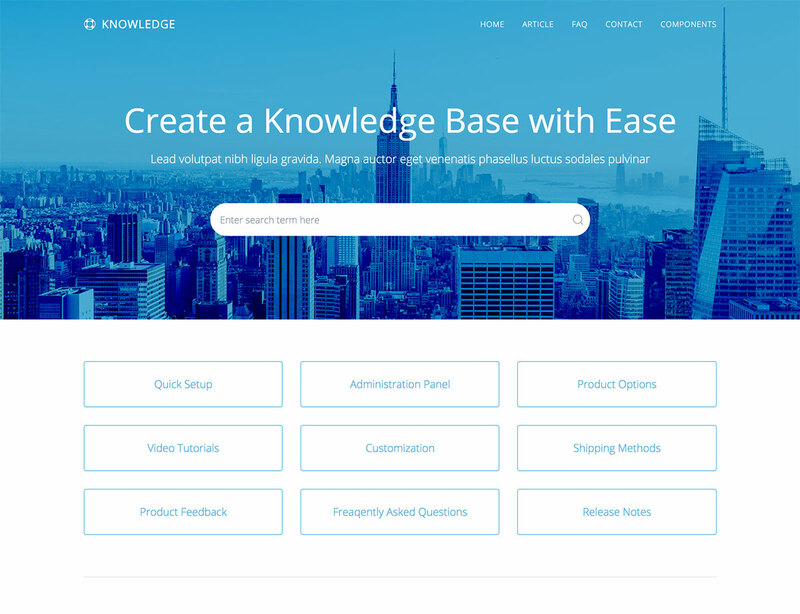 Knowledge is a creative, interactive and mobile-friendly Knowledge Base and FAQ HTML template that gives you all the personal space to share vital information with your readers. This template is designed to make building powerful and functional Miscellaneous Specialty Pages easier than ever. You will enjoy a bunch of smart features in Knowledge like Live Search, Article Scrollspy, Social Icons and Accordion FAQ Page. If you want to know more about this powerful pHTML template, just get it and try out! 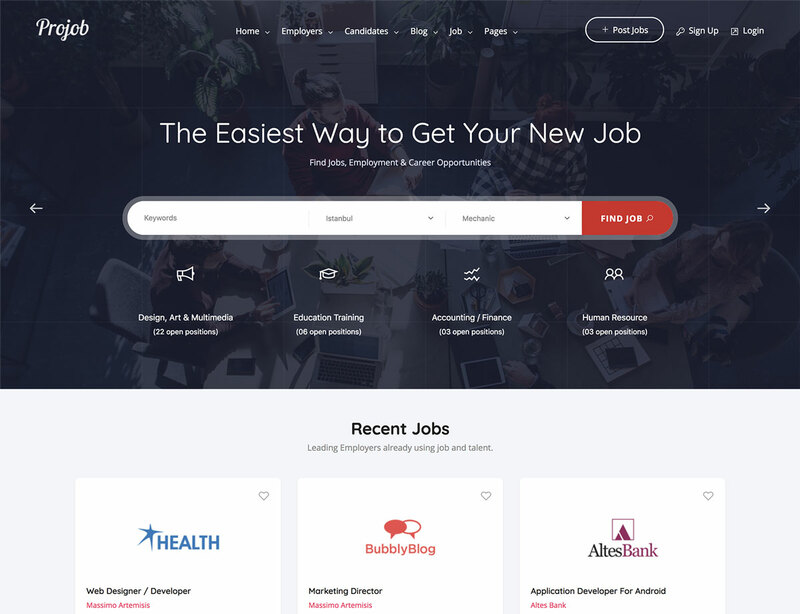 Jobhunt is a unique, incredibly thorough and highly modern Job Board HTML website template that allows you to create professional website layouts with various listing styles for Businesses. Every aspect of Jobhunt can be personalized to meet your preferences. The elegant home pages in this template will give you a chance to build a visually stunning website that will connect employers and candidates. Candidates and employers will love the convenience when it comes to signing up, logging in, posting jobs, managing profiles and finding jobs from Dashboard. 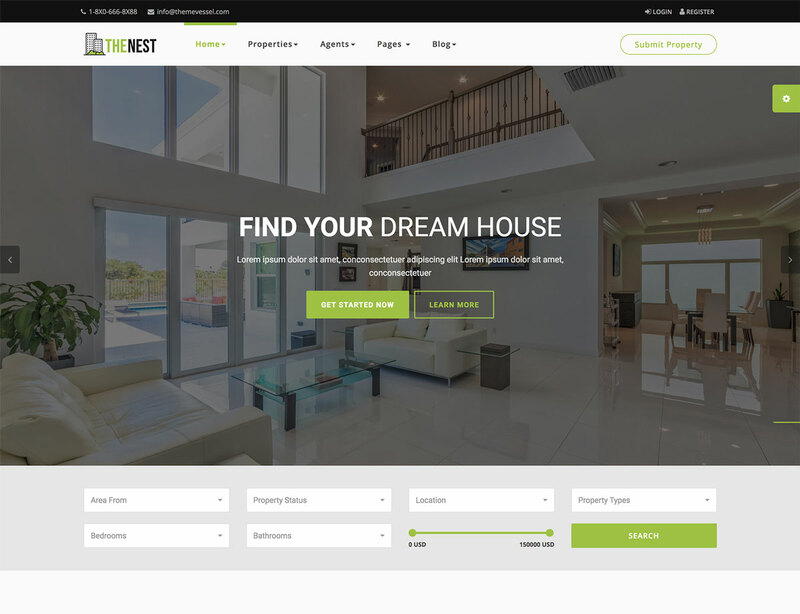 Nest is a flexible, carefully crafted and responsive HTML website template that provides efficient solutions for Real Estate Businesses. Built with Twitter Bootstrap, this template is aimed at improving your client base and enhance your exposure. The 5 Home Page layouts in Nest have been optimized for search engines like Google, Bing , and Yahoo Search. Other reasons why Nest has been included in this collection of the best HTML templates are that it is fully responsive and has been optimized for speed. Signature is an entirely stylish and Retina-Ready multi-purpose HTML website portfolio template that lets you create a professional-looking website. 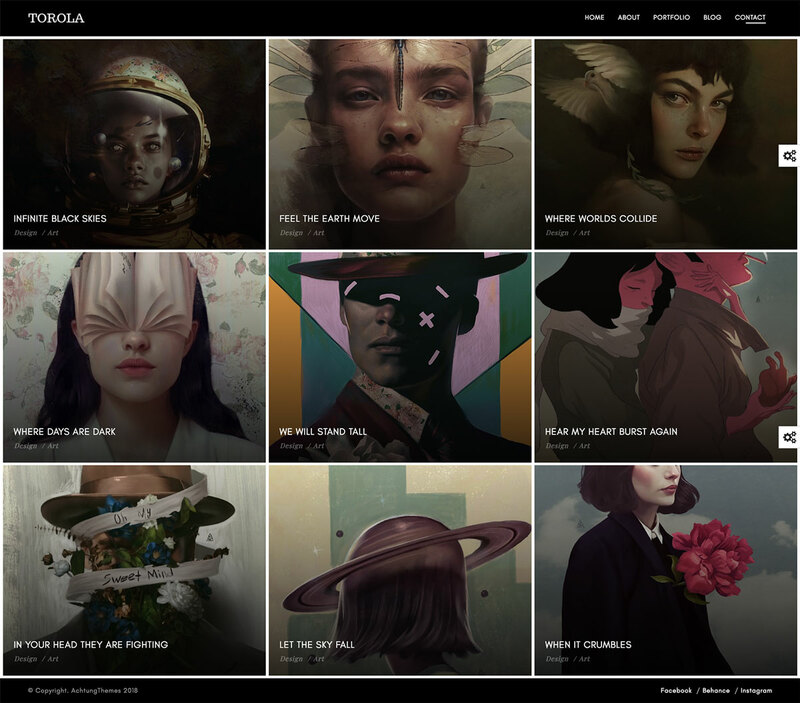 Signature holds a massive collection of 26 Unique Demo variants to cater to the needs of Actors, Freelancers, Designers, Illustrators, Photographers, Stage Professionals and Make-Up Artists. This beautiful template has 300+ Web Pages, 26 Header and Footer Styles and 26 Navigation Menu styles to give you a platform to share your thoughts to the world! Give a try to Signature template today and see it yourself. Trizzy is a multipurpose eCommerce Shop HTML website template perfect for your shop or business site. It has been carefully contrasted so that any product you present to your customers stands out. Like other HTML templates in this list, Trizzy has been developed using the best WordPress practices in mind and SEO optimized so your web content ranks well in SERPs. Smart Features you will enjoy in this template include jPanelMenu, 400+ icons, Working Contact Form, Mega Menu with Grid System, Multiple Shortcodes and Style Switcher. Torloa is easy to use, clean and responsive Creative Portfolio HTML website template suitable for a Portfolio website. Torloa is 100% responsive and adaptive to look good on all devices. Your visitors and customers will definitely adopt the design for their personal purposes. Smart Features in this theme include Multiple Slideshows, Entrance pages, Lightbox, Parallax Portfolio, AJAX Contact Forms and FontAwesome. Base hotel is a creatively designed HTML template based on HTML5. 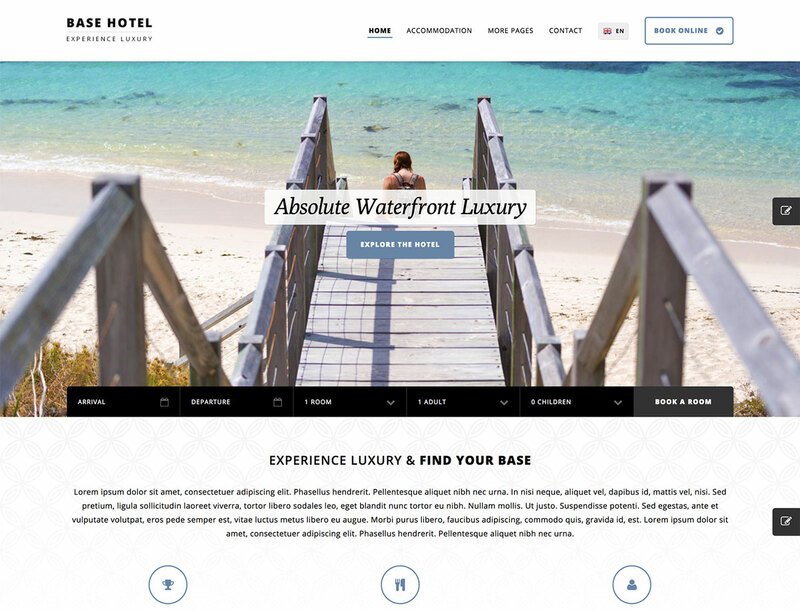 It is the best HTML website template for resorts, hotels and other accommodation providers. The elegant design and multiple layouts in Base Hotel will make your online visitors be automatically attracted to your website and become regular customers. Template features you will enjoy in this theme include a Promotional Popup Box, Functional Booking Form , and Hotel Guestbook. Instagram Feed Integration in Base Hotel will help you connect with your visitors on a personal level. 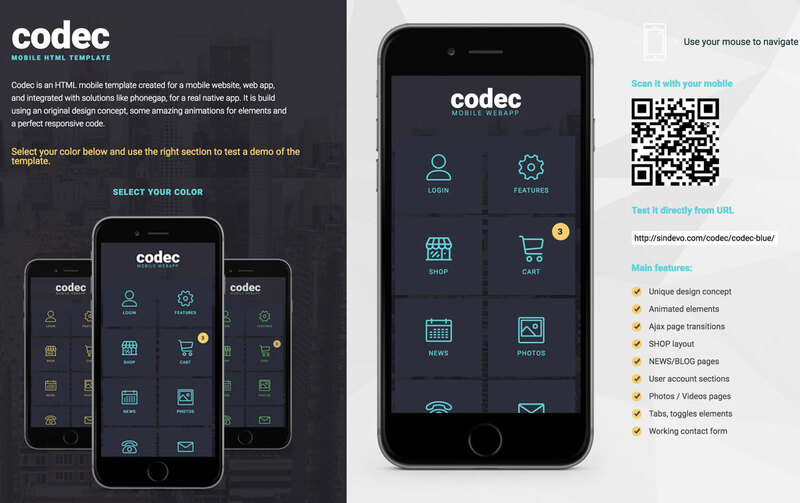 Codec is a Mobile HTML template perfect for a mobile website or web app. You already go above and beyond to come up with engaging ideas. The next step involves building a website that will showcase who you are and what you are offering. Codec template will help you do exactly that. This template is well-organized in terms of coding which makes it a breeze to use and customize your website. Built using an original design concept, Codec is cross-browser compatible. 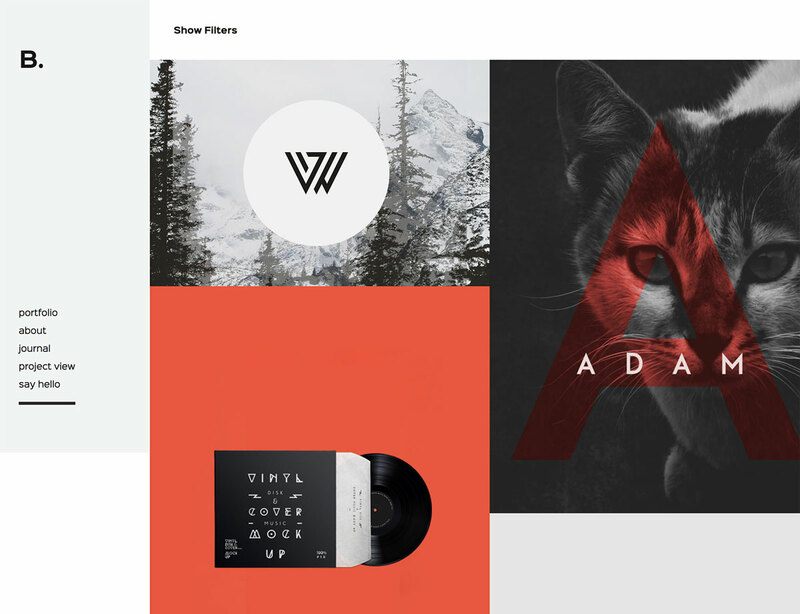 This premium template pays a strong attention to overall user experience and typography. Well , there you have it, hope you find our list of best HTML website templates for 2019 useful. All the templates in our list are built in accordance with the latest web trends, packed with a number of cool features and effects, and blend a stunning look with unparalleled functionality. Pick one that best addresses your needs to build your website effortlessly.